Friends of Workington Hall Parkland was supported by the Nuvia Fund with a grant of £500 to restore becks in the town centre. The original idea was to create a wildflower meadow and an area of the parkland was cleared and seeded. In spite of the area having been chosen on expert advice from the Council’s horticulturist, the soil conditions proved unsuitable and the wildflowers were choked by weeds. However, the group did not give up restoring their park; “we switched to willow-spiling along Scale Beck and Mill Stream,” said Michael Heaslip, Chairman of Friends of Workington Hall Parklands. 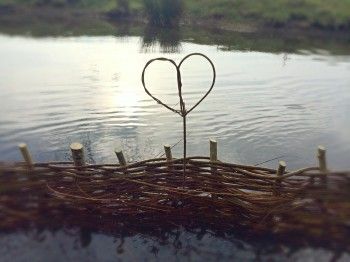 “Willow-spiling is a way of restoring eroded banks of becks using live willow strands which take root and stabilise the banks. “This also provided a good site for wildflowers to root on the newly backfilled bank. In total the project had around 25 volunteers from Lakes College, StayWest, WestHouse, Turning Point, Workington Nature Partnership and general members of the public. Michael said: “On some days in February the ground was frozen solid which made for much more challenging work. There were also occasions where the water was above welly height so there was nothing for it but to just jump in and grin and bear it, warming the water up in our wellies throughout the course of the day!